Heather Joy Albury of Nassau, Bahamas celebrates her divorce and makes sure people know about it! Nassau, Bahamas - SMILE OF THE WEEK! Heather Joy Albury of Nassau, Bahamas celebrated her divorce this week in a unique way! 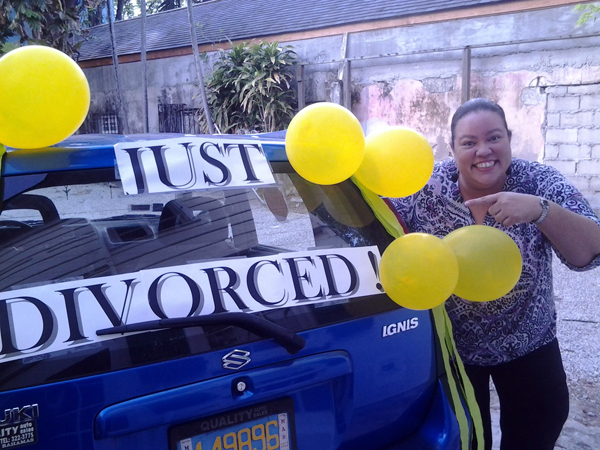 She decorated up her car with a "Just Divorced" sign. She wrote on her Facebook when posting this image, "Hear ye...Hear ye..Heather Joy is now officially Divorced. I'm now truly 'single to mingle'. *grin For the occasion I decided to do a little car decorating. *wink"
Heather later told The Bahamas Weekly, "I was married for 5 years to an Abaconian man and it took me 1 1/2 years to get the divorce finalized. Which is crazy, especially as we had no children or property to divvy up. In any case its done and I'm thrilled I can now move on with my life! When I decided to 'decorate' my car for the occasion I had no idea that so many persons would react as they have been."